I've been showing lots of denim bits over the last couple of months, and while these 'samples' are definitely now going to be a quilt in their own right, they were intended initially as experiments in working with denim, to see how the stitching I imagined would look in real life, but also to consider what effect it would have on how the fabric behaved, how heavy/stiff it became and what the implications of that would be. The plan was to get together with my sister, who is much more skilled in garment-making than I am, to try and create some garments. This was the weekend we got started. We worked with a combination of my stitched pieces, some old jeans which had not been stitched and a couple of pieces of remnant denim. These had a rather pleasing dull red reverse, which turned out to be a good thing, as one section of the pattern was cut the wrong way round. We considered a couple of fixes, but decided to go with the flow, so the red got onto the front! Oooh Kaja, so exciting - pattern drafting as well! I used to do a lot of that, it can be good fun, but it's a while since I've done it properly…you've got me all excited now! What can it be?!?!?! Love that shot of your machine :) Have a safe trip and look forward to seeing you on the other side. That looks like a lot of fun Kaja! You and your sister must be quite talented to design garments. This is going to be cool to see what you two have come up with! 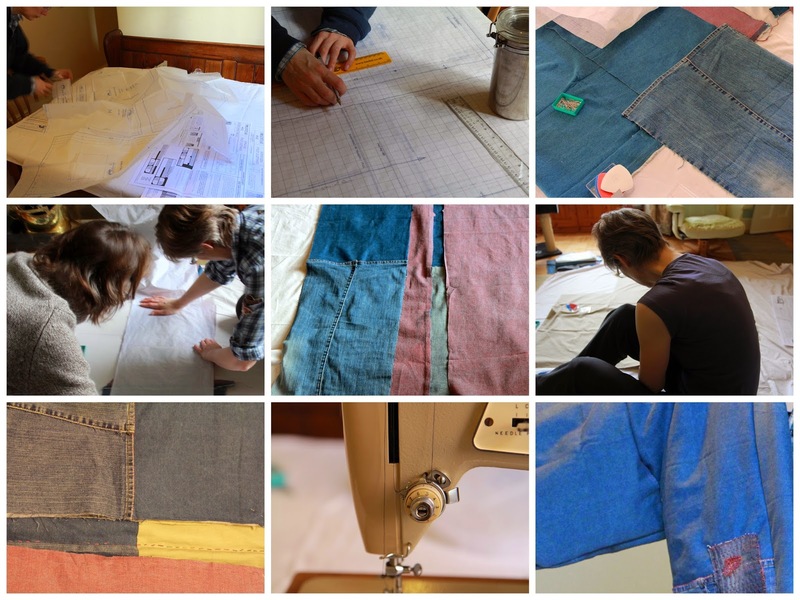 Loving the denim pieces and can't wait to see the finished quilt. I'm thinking that you won't have to worry so much about the hand-stitching coming out. Since you're planning a quilt, you'll probably mostly stitch them together rather than cut them apart as I was thinking. I wish one of my sisters would join me in sewing. I'd love to visit and sew but they prefer to have me do the sewing. lol It is easier for them! So happy that you two are having such fun.